LoudspeakersPlus has some recone kits available for some of the 18 Sound pro audio speakers that we sell. 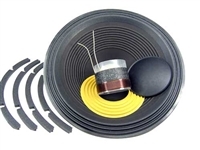 LoudspeakersPlus will install the recone kit - call us at 866.963.0733 for more details and to arrange your speaker repair. Put new life into your blown speakers now!